Did the National Democratic Alliance nominate A P J Abdul Kalam as its candidate for the Presidency because of his achievements at the Indian Space Research Organisation and the Defence Development Research Organisation or because the NDA government wanted to soothe Muslim sentiments after the anti-Muslim riots in Gujarat? And what is one to make of Kalam's eclectic beliefs? rediff.com spoke to Muslims to find out what they think of Kalam's nomination. The first part of a random survey of the Muslim community's views on the matter. 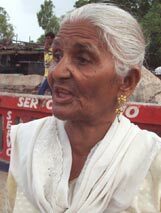 Alibabibi Sheikh, 70, who used to live under a public bridge near Idgah Dargah and has currently relocated to the Bakarshah Roja relief camp, Ahmedabad: I have not heard of Abdul Kalam. All I wish is that some one who is interested in peace and letting poor people stay in peace becomes President. I have just been through the worst experience of my life and wish to be left in peace. I have never seen so much pain and atrocity. Any one, Hindu or Muslim, will do, but it should be someone who can bring in peace and reduce the tensions. 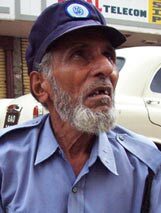 Ashanraz Shaikh, 75, a security guard at Usha Kiran Apartments, Ahmedabad, where both Hindus and Muslims live: Abdul Kalam seems to be a nice person. But he should be told that what our country needs is not an atom bomb but mohabaat ka bomb [bomb of love]. The good thing about Kalam is he makes these bombs but does not burst them. Such forbearance is needed in society today and, with him as President, our society may learn a thing or two. With him at the helm, at least there is hope that there might be a change. His actions have helped India feel a sense of security. Now we hope he will be able to instill this sense of security in all the citizens of the country as this is the need of the hour. Be it Muslim or Hindu, no one can live in peace without this sense of security. Fatima Anandwala, mother of two, who moved from Doshimia ki Chawl at Bapunagar, Ahmedabad, one of the worst-hit areas, to a refugee camp: A P J Abdul Kalam seems to be a nice person. I hope he will bring peace. We do not care if a Hindu or a Muslim becomes President. We just want someone who is humane and can give justice. We seek peace and want to be left in peace. 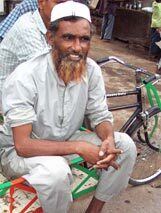 Abdul Salam Ali, rickshaw driver, Ahmedabad: Being a rickshaw driver, I have seen it all. I have seen the heart of the city and the people closely. The change will be good for the country, or so it seems at first glance. But we will have to wait and watch. People should not be taken at face value. Kalam seems to be an intelligent man and he might be able to do good as he seems to have a humane touch. He will be willing to understand the pain and folly that can result from different actions. Let us see how he acts and functions. The need, right now, is to rein in [Gujarat] Chief Minister Narendra Modi, Deputy Prime Minister L K Advani and even Prime Minister Atal Bihari Vajpayee. His appointment does bring hope. If things change at the Centre, then we can hope that this rot will be stemmed in the city as well. Khwaja Mohammad Raiq, advocate, Lucknow: I fail to understand why everybody wants to see politics behind A P J Abdul Kalam's nomination for India's top post; why don't people realise he is much more than just a Muslim? His nomination should be a matter of pride not only for the Muslims of this country, but for the entire nation. Zahid Hasan Usmani, electrical engineer, Lucknow: It is amply clear that the Bharatiya Janata Party is trying to wash its sins in Gujarat by pushing Kalam's name for the top job; after all, Kalam's name propped up only on second thought. Namaz is one of the five essential things laid down in Islam for anyone to be a true Muslim, so anyone not offering namaz cannot be regarded as one. I do not dispute his status as a scientist of eminence, but that is not the reason why he was being propelled to the highest office in the country. Colonel Fasih Ahmed (retired), Lucknow: Religion is a private affair and something strictly between an individual and Allah; Islam does not authorise anybody to question another person on that. For Kalam, his research and his work are his religion. Islam does not tell you to just offer namaz; there are so many other things that need to be strictly adhered to by a true Muslim. Those who question Kalam's credentials as a true Muslim must answer whether they are living like good human beings, which is what Islam prescribes. So what if he recites from the Bhagvad Gita? Islam recognises so many other religious books as ahele kitaab (word of God). Dr Mansoor Hasan, cardiologist, Lucknow: A person like A P J Abdul Kalam is not born every day. His stride to the Rashtrapati Bhavan should be hailed by the entire nation and its people; he is a jewel that will add to the glory of the high office. Limiting his personage to that of just a member of a particular community would amount to undermining his stature and status; and it is immaterial whether he goes to a mosque and offers prayers or not. Professor Nayyar Masood, former head of the department of Arabic Studies, Lucknow University: Kalam should be held above the considerations of creed and religion; that he is a Muslim is incidental. I do not deny it adds to one's sense of pride since he would be the third Muslim, after Dr Zakir Hussain and Mr Fakhruddin Ali Ahmed, to ride on to the country's highest pedestal. Maulana Agha Roohi, well-known Shia cleric, Lucknow: I hail the National Democratic Alliance for proposing Kalam's name for the President's post. All kinds of suspicions were aroused and insinuations made over Kalam's nomination simply because his name was proposed by Prime Minister Atal Bihari Vajpayee. If it were any other party doing it, they would have gone about blowing their trumpets and proclaiming their secular credentials. 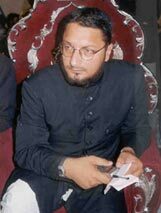 Asaduddin Owaisi, 33, leader of the Majlis-e-Ittehaadul Muslimeen and member of the Andhra Pradesh legislature, Hyderabad: There is a general disenchantment with politicians among the masses, which is why the people are accepting the candidature of a non-politician like Abdul Kalam. As a top-ranking scientist, he has strengthened the country's defences. Muslims are surprised to hear that he starts his day by reciting from the Holy Gita. As Muslims, our day starts by offering the fajr (dawn) prayers. It is also strange that Kalam says he gets solace by playing the veena whereas, for Muslims, reading the Koran -- the word of Allah -- gives the greatest solace. At his first press conference after his nomination, Kalam recited verses from the Gita. Nothing wrong with that, but he could have recited the Quranic verses in which a devout human being thanks Allah for bestowing knowledge and worldly positions on him. Whether a Muslim follows his religious tenets strictly or not, that is between him and Allah. But when a Muslim says he finds solace in the verses of other religions' holy scriptures or seeks blessings from spiritual leaders of other religions, then it is natural that questions are raised about his Muslim identity. People who criticise such a view should tell us how they would feel if a top-notch scientist sits at the feet of the Imam Bukhari seeking his aashirwad (blessings). Their answer will reflect our feelings. It is easy for a Muslim to get elected to the highest constitutional post in our country, but it is near impossible for an ordinary Muslim to get justice and fight against discrimination in all spheres of life.